Lest there be any doubt of the Lincoln Mark VIII's sole purpose in life, our answer to Matthew McConaughey's often parodied Lincoln ads in October settled the matter for good. Its raison d'être is simply this: existence as the ultimate domestic personal luxury car - not slalom speed, volumetric efficiency, fuel efficiency, or randomly peppering conversations with French phrases like a complete jerk. But what it wasn't pigeonholed into a one-dimensional use? With a handful of modifications, could it become an entirely new car and assume an entirely new driving experience? Probably not, but that didn't stop this guy from trying. Find this 1997 Lincoln Mark VIII with five-speed conversion for sale in Peoria, IL for $6,500 via craigslist. Because the Mark VIII shares its engine with the Mustang, the two also share an aftermarket. Oddly, the seller left the engine untouched, save for a full exhaust system. That's fine when you start with Ford's Modular 4.6-liter V8, an aluminum DOHC unit, good for 290 horsepower in all the right places. The old 4-speed automatic transmission and drivetrain were replaced with gear from a fifth-generation Mustang. That includes the Traction-Lok limited slip differential, now with 3.73 gears. The Mustang parts sharing continues in the upgraded brakes, hubs, and rear shocks. Aftermarket subframe bushings and sway bars round out the suspension upgrades. If you don't like the coilovers and chrome Saleen wheels appearance in some of the pictures, you're in luck: the coilovers aren't included, and more sensible Mustang wheels can be had instead. Even with a custom tune to accommodate the transmission swap, this Lincoln has a bright orange CEL blemish in its sandy tan interior. The rear wheel bearings are shot, traction control and ABS are spotty, but this car is otherwise ready for daily duty. Or a rally course. Or Laguna Seca. Like an angsty teen determined to find a new identity, who knows where it will end? See another car with a personality change? Email us at tips@dailyturismo.com. And everybody thought the Aztec looked bad! 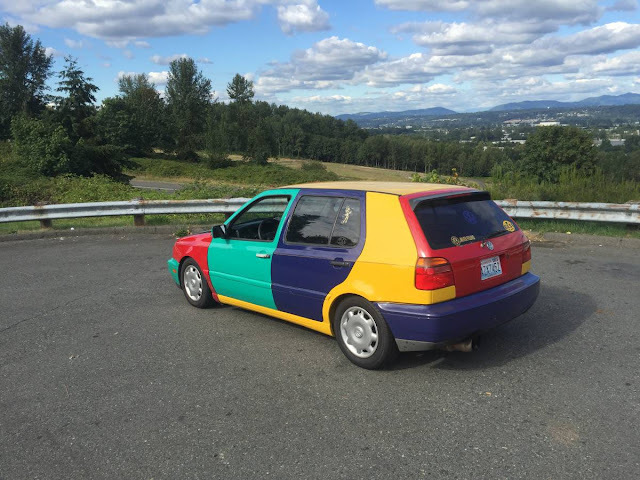 One of the worst styled cars I have ever seen. Correct me if I'm wrong; what you're saying is a clean, less detailed and aerodynamic shape? What about the Chrysler Airflow from the 30s? What I think you're saying is an interesting point. But what I contend is that by the time the Mark VIII rolled around, that shape and smooth detailing was, in fact, old hat at that point. I would use the lack of tremendous interest on the part of buyers would only seem to support that. The Mark VIII shared much of its platform with the '89 Thunderbird/Cougar, and that car was rumored to have missed its weight targets by so much that people were fired over it. Cannot confirm that. A catastrophic joke of a car, One hundred forty raging horsepower, capable of flinging the nose of the air-suspended Continental toward the heavens - well, faster than it could fling the car down the road. A car for those elderly who thought those damn Buicks were just too fast. And, when it came time to replace that POS, Ford came up with...another Taurus-based Continental! This time, they figured what the world really needed was a four-cam mod-motor spinning the front wheels. Their competitive myopia was incapable of considering anyone further afield than, say, the crew in Lansing making effectively the same mistake. You could argue Ford's STILL screwing that same chicken with the present Lincoln range, the first last and only Lincoln worthy of the brand since the Mark III, the only Lincoln that's ever been competitive in any form with the furriners, was the LS, and that got shot down as too expensive to build a decade ago. Those are good points, mrkwong. Two things occur to me, reading this particular post. The first is that design is basically all about lines and curves. Whichever is in at the time, will go out and return sooner or later. But we always go through these stages where most car design is all about the smooth, wind-cheating sleekness and the other stage where everything seems to be about razor edged squareness. It has a very ying/yang, masculine/feminine, cyclical pattern to it, I think. The other thing that comes to mind is the lost opportunity that Ford had with PAG. The LS you mentioned was a good example, as the DEW was developed and shared with Jag. As you insinuated above, most folks know that Lincoln's line of cars are just rebadged Fords. I believed, ultimately, nobody really cares about that. I think, in Lincoln's case, buyers still percieve the brand and cars as stodgy and Ford doesn't seem to be able to figure out a way around that. And yet they seem to keep struggling on instead of doing the sensible thing of (sorry, Lincoln fans) killing the nameplate off, just as GM did so unceremoniously with its seemingly less than profitable brands (that's a whole 'nother conversation). It's an interesting conundrum that the car world has faced since the beginning; how do you create a luxury brand from an existing brand (or, in the case of Lincoln, bring it up to a level it hasn't been for a long time)? The (not so) simple answer, in my opinion, is that you have to create an all new one (Lexus) or pour money into an old one that has an established heritage (Lincoln's heritage doesn't work today, that's clear). That last option would seem optimal to most enthusiasts that I've spoken to. And yet, that task seems to have been pretty much impossible. Imagine if Ford had chosen instead to end Lincoln and bring Jaguar up to truly modern standards (and combine it with Land Rover, in the process - but that's just my idea and I'm sure nobody agrees with me). That would have been an interesting scenario. Would it have worked? Looking back historically...no. Which is a bummer, because I still think it's a grand idea. Jag has such a rich history and it seems to me that it would be easy to take advantage of. Case in point; DT, DTers and most enthusiasts that I know cringe at the thought of the Lincoln MKZ. Fine, we/they are absolutely entitled to their opinions. The truth is, we actually know a thing about this topic. Forget that. Blindfold the "everyday" person, put them in a loaded loaded, AWD turbo Black Label and have them drive it for a week. Unless they just don't like sedans or need a minivan or something, they will absolutely fall in love with it. Seriously. I've seen it happen several times. It's weird, I know. Nearly inconceivable. But they'll like it so much that they'll scrape up the cough gag choke over $50 grand(!) to buy the thing (assuming they can afford it). Unless they're badge snobs (and, really, who isn't - at least 50% or more of the buying public don't see anything past the badge on the front...MB and Audi, anyone? )...and there's pretty much nothing that can be done about that. I would suggest that the current MKZ would have made one heck of an X-type. I really like this! It is about the best one could do when working with this a platform. I'm sure the DT staff saw this car for sale on eBay, too. But this one might interest some of the other readers, as it did me: 1998 Lincoln Mark VIII LSC "Terminator Series"
That one is good looking as well. The only thing that threw me off was the 3rd picture. You catch more you can catch more flies with honey than with vinegar. They should try something w/o a mullet next time. These things are a little on the porky side and that version of the 4.6 wasn't exactly a torque monster but with the 3.73 gears it'd probably work okay. You've got to deal with the air suspension, and perhaps the biggest problem with ownership of any aging Ford product except perhaps a Mustang or an F150 is that parts availability is awful. I don't have much of an opinion on this car (other than it's not for me), but I do recall in the mid-90's, I was driving a friend's 2nd gen Mitsubishi Eclipse GSX in an area that isn't far from (and has similar roads to) the Tail of the Dragon in TN. I came up behind one of these on a particularly curvy stretch, and the driver did his best to lose me. I still remember the look on the driver's face when I passed him on a short RV overtaking lane and then left him far behind.....had to be heck of a blow for the owner of a car that Motor Trend was pumping as pure performance, to get killed by a car costing half the price.